MY MOST SEARCHED WORD: GIGOT! 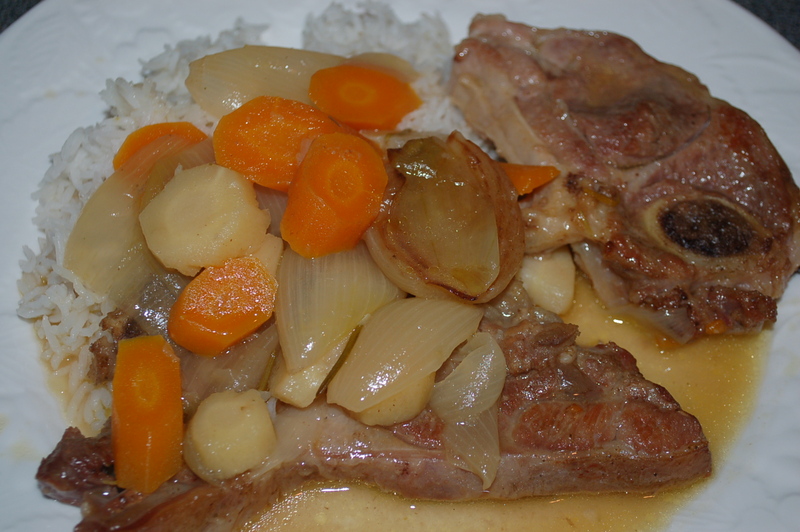 And a new Gigot Chop Stew: Australian Lamb Shoulder Chop Stew (serves 6) | Crappy Kitchen - Good Dinners! 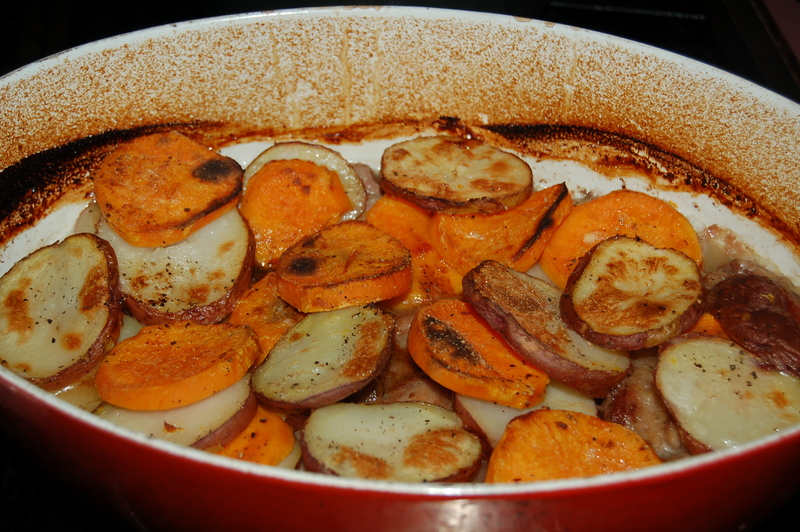 ← Roasted Vegetables 101 – Learn how to do this right every time!!! I got a stat report from WordPress (my blog server) at the beginning of this year and it was an interesting read. It was nice to see how over the past several years the visits to my blog have grown by the thousands. However, the most amazing fact to me is how many times a day GIGOT CHOP RECIPE is searched! This dinner was made in Ireland in August 2012 and has been made by someone other than me every day since! Gigot is a term I grew up with in Ireland and refers to a cut of meat from the forequarter (shoulder side) of a lamb, but here in the United States the word is pretty much unknown. That does not mean that a gigot doesn’t exist. I have found two explanations for why this chop is called a gigot that I am satisfied with: 1) the word is taken from the french word gigue which means fiddle (fiddle used for gigs) and suggests that the shape of the fiddle is similar to the shape of the leg of a lamb, and 2) it could also have come from the french word giguer which means to hop or jump, which conjures up an image of a little lamb frolicking in a green pasture! Of course this would suggest that the “gigot” comes from leg chops but as far as I know this is not true (at least for big lamb-eating places like Ireland and Australia) – all very confusing indeed! The trick now, being in the United States, is where to find a good lamb chop that is the equivalent of the gigot chop? This is easy enough if you have a real honest-to-goodness butcher behind the counter, but sadly these days one is hard-pressed to find someone in the meat department in a supermarket in most places around here who really know their meat. Of course it is possible, but I find for something like this, it best to do your own research so you know exactly what to ask for. Go into any (almost any anyway!) 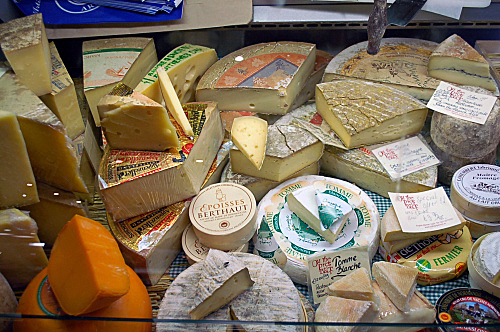 supermarket in Ireland and there are four things you can count on; great bread, cheese, fish and meat. There is always someone working there who knows a great deal more than you which helps enormously when deciding on certain cuts of meat or what kinds of fish can stand up to stewing or frying etc? The supermarkets in Ireland of course have those same aisles of sterile-y packaged meat and fish but there is always a meat or fish counter where someone is working on filleting fish or frenching chops, to answer any questions you might have. The supermarket that is closest to where I live now has a buzzer in the meat section that says “press if you need help” which I have pressed a few times but invariably no one shows up or they think I’m mad to even ask about say grinding some lamb so I can make burgers. This would mess up their pork and beef grinders I’m afraid. Most of the meat comes in prepackaged, so changes are a little difficult. Nowadays this service is only available in more upscale supermarkets which to me is such a strange thing. Why should it be a luxury to ask someone to cut a piece of cheese or butterfly a roast, but that’s the way it is I’m afraid. We are making progress with the “slow movement” and the Farm to Table trend, but while this is a good thing, it also makes ordinary food seem so complicated and exclusive. Back to my Gigot Chop quest! I decided to make a Gigot Chop stew here in the United States so that at least when this recipe was searched I would have two to choose from; one from Irish Lambs and now one from Lamb I bought the other day in my favorite “upscale” supermarket. 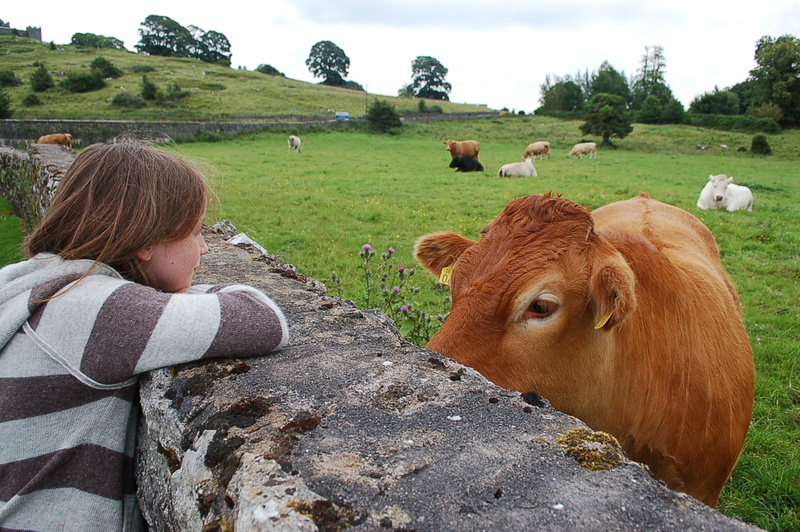 I could have gone to a Butcher Shop (now another Trendy way to buy your meat here!) but I wanted to find this elusive piece of meat in a more general location. Most people do their entire shopping in one place so that was where I was determined to find it. This is the Forequarter of a lamb where the chop for lamb stew typically comes from and where the “gigot” comes from. This diagram comes from a fantastic Australian website; Beef and Lamb.com.Au that you should most certainly put into your favorites if you want to find out more about meat cuts. It even has an app you can download for beef, lamb and goat meat cuts! By the way, they do not call any chop from the forequarter a “gigot chop” so I’m guessing this is strictly a European term. I’m afraid when I mentioned the word “gigot” to the guy behind the counter he was dumbstruck and headed off to find a guy “that really knew the product” and I could ask him. As helpful as he was, he hadn’t a notion and never heard the word before in his life. Of course this was understandable and after we talked about the cut of meat coming from the shoulder and I was going to stew it, he directed me towards the piece of meat he was sure that if it wasn’t a gigot exactly, it would make a great stew! Well if this was my choice I was going to go with it and see how it fared. The lamb chops he recommended were labeled Lamb Shoulder Arm Chop and Lamb Shoulder Blade Chop, the latter being $1 more per lb. The arm has a little bone with the marrow which seemed more similar to my gigot chops, but the blade had a nice bit of fat going through it so I couldn’t decide. In the end I bought both kinds and would cook them together and see if one ended up tasting better than the other? I thought that at least now there were more choices for anyone who could only find one kind wherever they shopped. I know, this seems all so nit-picky but when I am hellbent on cooking a specific dish I do like to use the right ingredients. So this post is for all those nit-pickers out there like me. And the people who are only interested in the recipe can skip all of this foody-nonsence and go straight to the recipe! These chops are organic (I figured that would put them in a similar category to the grass-fed lamb that I used for the stew in Ireland) and are actually not from the United States. 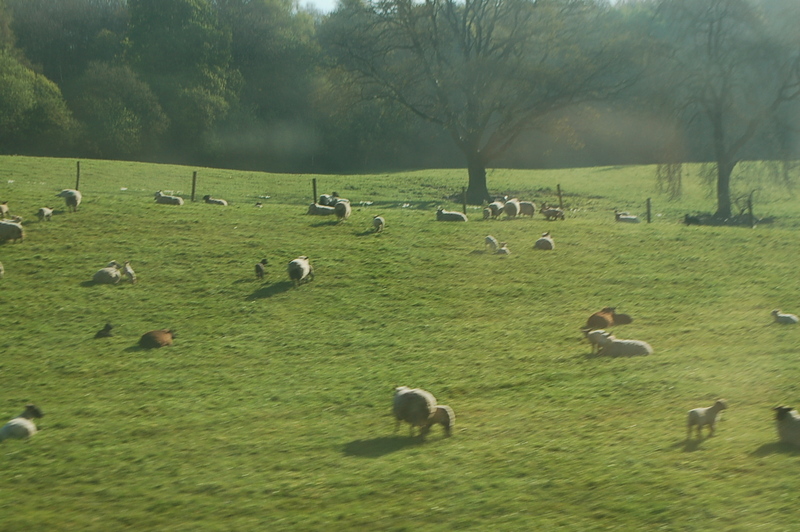 It is near impossible to find lamb that is from here unless you seek out a boutique organic farm or specialty butcher shop. These chops are from a country with as strong a lamb tradition as Ireland; Australia. It was an amazing stew, and I would go so far as to say that this may even have been a better dish than the one I made in Ireland. 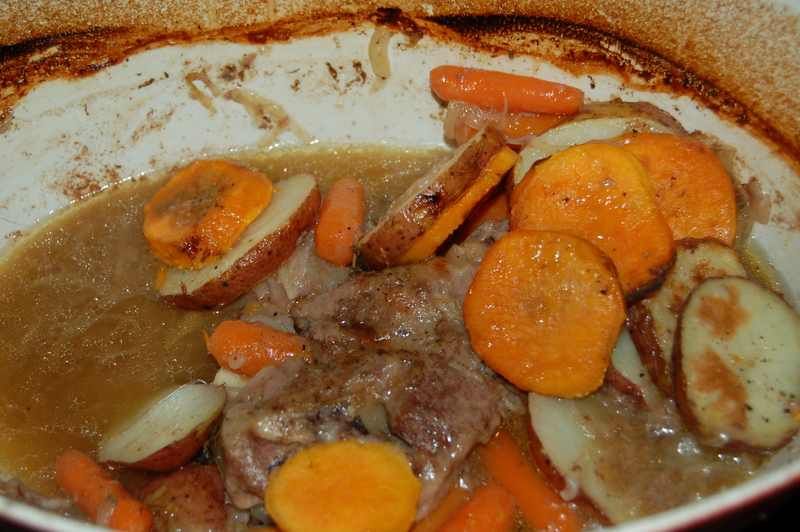 It is a different style of Irish Stew in that I didn’t pan sear the meat or sweat the base vegetables. I layered the ingredients into a heavy casserole with a dredge of flour on the meat and a little salt and pepper on the veggies and let the oven do the rest. I did make sure there was also some fresh thyme in the mix as lamb without thyme just wouldn’t be the same! After an hour in the oven I layered the top with some par-boiled potatoes and put it back into the oven to finish cooking. 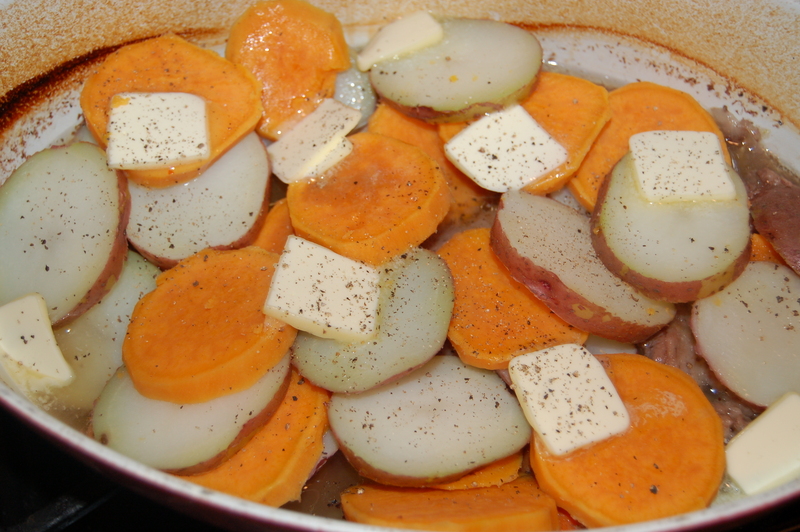 I used what is traditional, regular white potatoes, but also added some sweet potatoes with them. I had one on hand and I thought the sweetness would pair great with the flavor of the lamb. It was a good decision! This was one of those dinners where the whole table was in absolute reverie, too busy sopping up sauce and getting the marrow out of bones to even talk. All I could here was the sound of food being lapped up. 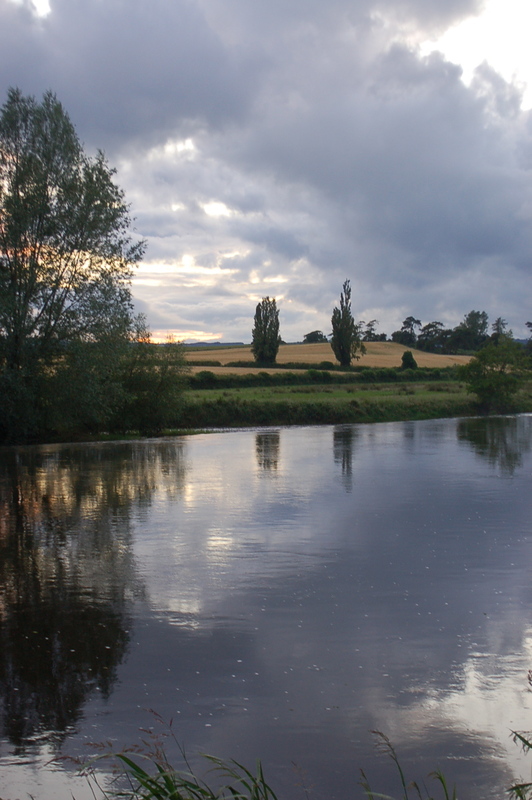 The River Barrow (the river flowing through County Carlow where I grew up). Cooking this lamb stew last night brought back some lovely sense memories as the aroma from the oven permeated my kitchen. 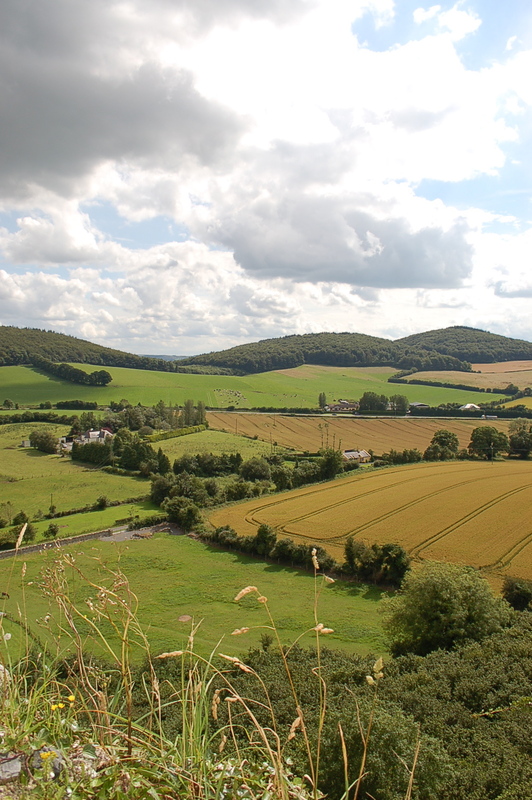 Yep – now I’m homesick! 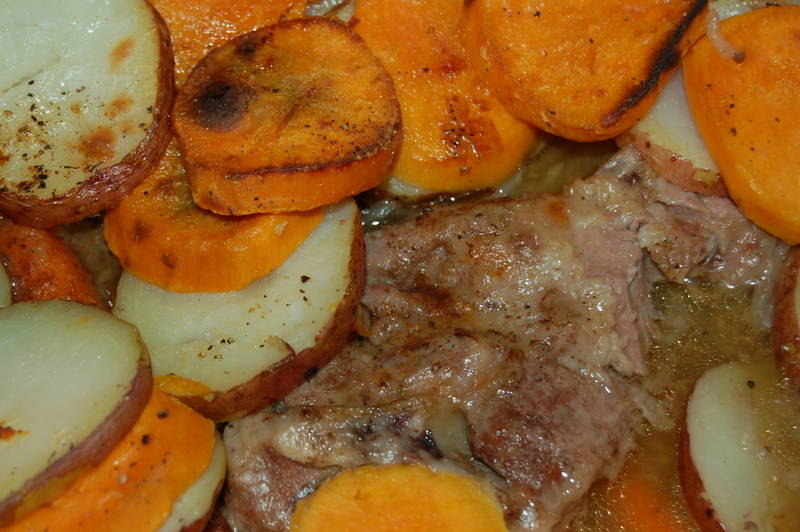 So if you are curious about Gigot Chops and think you cannot find them here in the United States (or you are in a place where that’s what they are called and you are still craving a dinner like this! ), go out and grab any kind of lamb shoulder chop you can find and you will have the right cut of meat to make this superbly unctuous dinner. This will be a great dish to have in your repertoire to warm cockles and hearts on those long wintry nights in your future. Also worth mentioning is that this recipe could be made by a 5-year-old – super simple! 1 – Place flour on a dinner plate and add several grinds of pepper and 1 teaspoon of salt. Pat the chops with a cloth or paper towel to dry them and dredge in flour. Lay half of the chops in the bottom of a heavy-duty casserole dish. Sprinkle half of the thyme over the meat. 2 – Add the onions and carrots in an even layer and add the rest of the fresh thyme leaves. Top with the remaining chops and add the broth. Only add as much as it takes to get to the beginning of the top layer of chops. If 2 cups is too much, then use less, or more as the case may be. Cover tightly with lid and place in oven and cook for 1 hour. 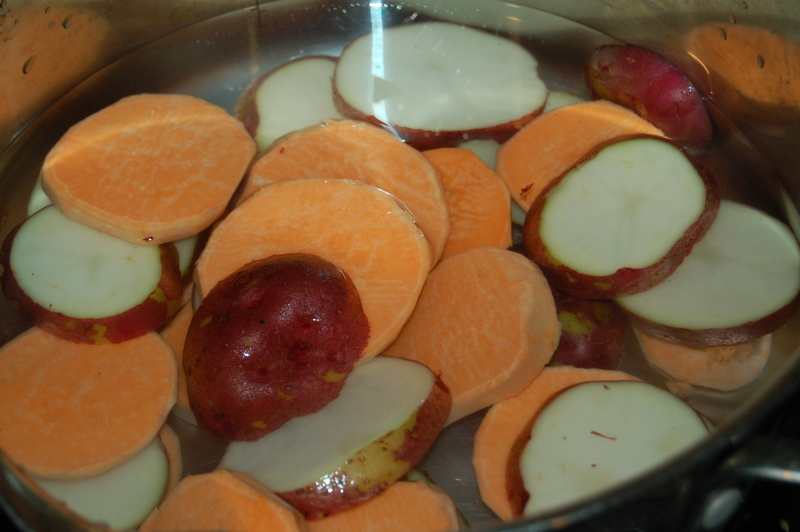 3 – In the meantime, parboil the potatoes by placing in pot, cover with cold water and place on high on stove top. Cover with lid and when the water is boiling, time potatoes for about 5 minutes. Drain gently into a colander and set aside until ready to use. 4 – Remove casserole from oven and remove lid. Layer the potatoes on top and dot with the butter. Sprinkle with a little salt and pepper and return to the oven for about 35 minutes. If the potatoes are cooked but not browned by the end of the cooking time, turn on the broiler and brown the potatoes (looks much better on presentation). Serve into warmed shallow plates and dig in! I had bread and a salad on the table to go with this hearty meal. This entry was posted in dinners and tagged australian lamb stew, australian lamd, beef stew, blade chops, gigot chop stew, gigot chops, gigot lamb chops, gigot stew, hore abbey, Ireland, irish sheep, irish stew, irish trains, lamb shoulder blade chops, lamb shoulder chop stew, lamb shoulder chops, lamb stew, shoulder chops, The Rock of Cashel, tipperary. Bookmark the permalink.